The year was 2004. Friday, August 13, 2004 will forever be one of those days in my life that I remember exactly where I was, what I was doing and what the bad news was that I was being told. I had been enjoying the day at the Wisconsin State Fair with my husband and children. We had eaten our way through the fair and were in the horse barn watching the animals being judged. It was the perfect sunny day, nice temperatures, and we had already dropped $250 on lots of food – YUMM. It was around 2pm that my cell phone rang and my sister (who lives in Florida) was on the other end. Something wasn’t right in her voice and I knew this wasn’t going to be good. Her news was that Hurricane Charlie changed direction and was headed directly at her community. She was going to try to board up her home and prepare to evacuate herself and our mother if needed. I did my best to calm her fears and we spoke every hour until 10pm that night. The next phone call I received was 6am Saturday morning, August 14. “Hello,” I said. The response was shrill screaming by my sister, “Gigiidmd kdldo ioeir diidid msopos ppfod mmmssi,” which made no sense to me. And finally I discerned, “A tree fell on my house!!!!!! 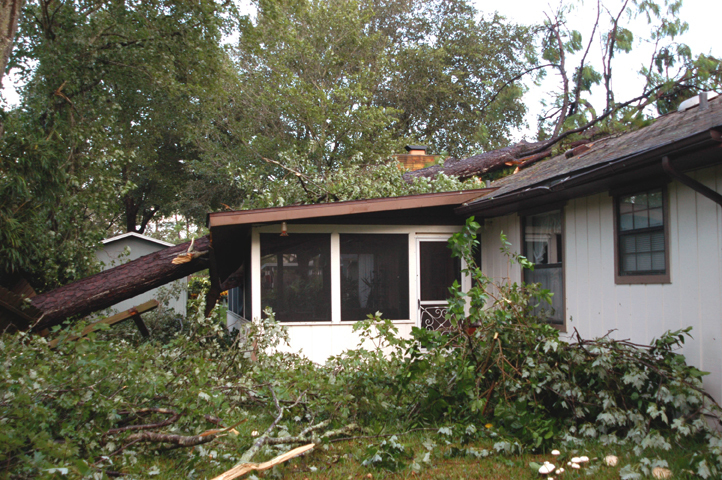 !” It was the 80’ pine tree in her back yard that went through the roof. She was ok, friends were ok, but the neighborhood had hundreds of trees come down. I told her I would get right back to her with a plan. 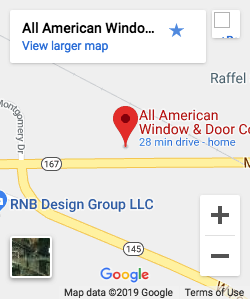 . .
And of course the plan was . . . . . . All American Window & Door to the rescue!!! We knew the store shelves would be bare in Florida so we spent the day loading a van and trailer with tarps, chainsaws, gas cans, tools, generators, 50 gallons of water, 35 gallons of Gatorade and food. We purchased $2000 worth of plywood and lumber and six of us started driving; Sister, Brother-in-law and Employees to the rescue. We arrived in Florida at her home 24 hours later. The destruction was amazing to see. Most people had roof damage and most people were in shock. We got to work clearing trees and unloading our trailer until late that evening. The very next day, we were first in line at the local roofing supply company, with our company credit card in hand, purchasing tar paper, roofing materials, fasteners etc. My sister’s insurance company was very happy that we came to her rescue. We provided our credentials and they gave us permission to start immediately because we were a legitimate licensed home improvement contractor in Wisconsin. We were waived from the normal restrictions. We worked diligently for an entire week, tearing apart the sunroom and family room roofs, hauling debris to the dump, taking the tree out of her house, rebuilding the roof framing and finally reroofing. We even put two skylights in for her!! My sister’s home was the first in her neighborhood of several hundred homes to be fixed. Neighbors begged us to stay and work on their homes too. We submitted our bill to the insurance company and we were paid within a few weeks. It took several years for all the blue tarps to disappear in my sister’s community and for the buildings to be repainted as well. I still miss all the trees. I love her skylights and the new roof color. When I visit now, I still feel a sense of pride that we came to her rescue and accomplished all the work. After all, what are sisters for? She’s the only one I have and we have a very close relationship. It was a no-brainer. Congratulations All American Window & Door on a job well done – in Florida – after a hurricane!! !